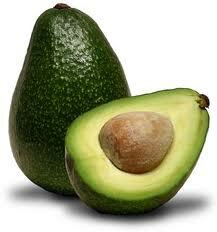 Including special avocado fruit because they contain 20-30 times more fat than other fruits. This fat content can provide enough energy when consumed. This type of fat they contain is unsaturated fat, which happens easily digestible and useful to the body. Thus, simply providing high avocado energy behind it is bitter and not tasty and delicious. If sorted, nutrient content contained one avocado is as follows: 95 mg of phosphorus, 23 mg calcium, 1.4 mg iron, 9 mg sodium, 1.3 mg of potassium, 8.6 mg niacin, 660 mg vitamin A; and 82 mg of vitamin C.
Beside rich in fat, avocados are also rich in minerals, all of which are useful to regulate body functions and stimulate growth. Iron and copper contained in them to help the regeneration of red blood cells and prevent anemia. Also, simultaneous fiber helps the digestive process. In addition, it can lower high cholesterol levels because it contains carbohydrates and unsaturated fats.